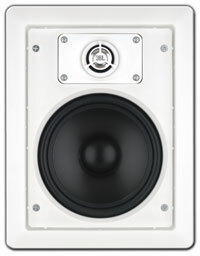 Premium in-wall speaker designed for applications where top performance is required. The high performance 6-1/2 inch woofer features a polymer-coated aluminum cone with pure butyl rubber surround. The 1" pure titanium dome tweeter is mounted on a low-diffraction swivel-mounting system enabling the user to direct high frequencies where required without the diffraction distortion inherent in other aimable tweeter designs. The optional Control 126WT contains a 70V/100V transformer for use on distributed loudspeaker lines. Optional MTC-126RIF Rough-In-Frame for new construction installation to wallstuds. Low-Frequency: 165 mm (6.5 in) polymer-coated aluminum cone, pure butyl rubber surround. Crossover Network: 3rd order (18 dB/oct) low-pass to the woofer and 3rd order (18 dB/oct) high-pass to the tweeter. 99 mm (3.8 in) front of wall to back of speaker.